Over the last few days, I managed to pretty much finish off the rest of the to-do hacking for the MOTHER 1 portion of MOTHER 1+2. I might still need to fix some bugs and maybe add an intro screen, but I’m hopefully done with hacking the game. Now I just need to polish the text up, do lots of testing, and package everything up nice and neat, possibly with some extra goodies like we did when we released the MOTHER 3 patch. 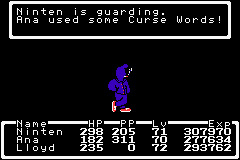 While testing battle text, I noticed sometimes it would say something like, “Ninten used a Curse Words!” or “Ninten used a Orange Juice!” So I added a custom control code to use the right article, this was so much easier than with MOTHER 3 since I had already written my own battle text parser for the auto-wrapping. So that’ll make battle text a little nicer. I did a bunch of other stuff too, but I forgot to take pics so oh well. Anyway, I need help with some stuff, so if you’re an EarthBound Zero/MOTHER 1 fan with some spare time/super knowledge, this might be right up your alley. @The chicks at the Canary Village have lovely voices. @”The crowd becomes restless and upset.’ @What in the world is that stone with a hat on! @Go ahead, poke your nose into other people’s @business. It’s what makes playing the game so fun. @Oops! It’s gone into orbit. @A success… @sort of. @Please come again to pick up the rest of the Goods. @Are you Ninten’s friend? @I see… But I can’t give you Ninten’s Goods. @Did that weakling Lloyd run away from you? @Where do you think you can find such a man! @Having a tough time? I’m so worried. @What a surprise! Our hero Ninten returning alone! @Won’t you stop and rest for a while? @Little girl! This is no place for a child like you. @I’m busy, So I can’t help you right now. @You’ll have to come back later. @This game I heard of @was titled EARTH BOUND… @don’t know exactly why… @because it really doesn’t matter. @So if you shouldn’t judge a book by its cover… @Don’t judge a game by its title. @Did you come for your Goods? Here you go. @I’ve given you all the Goods. Please come again. @Is it all right to go back to the data SAVEd earlier? Some of the lines above sound like they might be used in a hospital or healer place, but I can’t actually find them when I play through the game. Also, the secretary in the Podunk/Mother’s Day city hall – does she ever change what she says? 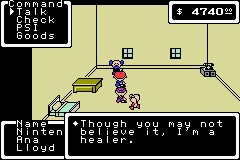 With the final patch I also plan to include a partial translation for the stuff in MOTHER 2, I’ve started looking into it but haven’t gotten far yet. I estimate the final patch is still at least several weeks away if all goes well, but it’s getting close! Also, did the idea of updating battle graphics go by the wayside? It would definitely have to be a team effort. “Oops! It’s gone into orbit” sounds like it’s describing the usage of the Real Rocket item sold by the science teacher in Twinkle Elementary School. I think the secretary says something about how to recruit Ana at some point. Never seen any of the lines… Amazing update! Thanks, Mato! Acedio: I’d really like to update the graphics, but it’s way too much work for the time I have right now. I’d also really like to update ALL the graphics in the game, but that’d be even more time that I should really focus on other stuff. Jeffman has the basic code worked out for changing the enemy gfx at least though, soo I think the rest of the hard work to implement that would be changing all the graphics to the new format (hoping that there’s enough space now) and doing a lot of palette code hacking. Oh, I remember a couple of these..
#4 is when you buy the Real Rocket in Twinkle Elementary from the weird scientist guy. #16 is in Ellay’s hotel, on the second floor, room on the left. That’s right off the top of my head, I don’t have the time to check the others, however. I think the first one, the one about Canary Village, was changed in EB0. While talking to citizens in Podunk, a girl refers to a man that lives in Canary village. I think that the first string was changed to that. I don’t know whether or not it was, but I thought I’d throw that in. #6 is if you go to Ninten’s house when he is unconscious and you talk to Minnie, or when you talk to the Mysterious Goods-Keeper in Magicant (when Ninten is unconscious)… I think. And about the secretary… yes, she says something like “You will meet a girl in your travels”. Whatever it is, she is basically saying that you are going to meet Ana later on. Sorry for triple post, but I have a question. There was a version of EarthBound Zero (called just Earth Bound) that had the favorite food character limit as 11 characters, and you could fit “Prime Rib” in there. I was wondering if you could implement that? I know I have asked this before, but I was just wondering if you had made a decision on that. Oh, and the Loid line seems similar to what those kids say about Loid being a weakling. The stone with a hat seems to be for the LIVE HOUSE in Ellay, where you sing. I’ve never sang on the stage while petrified, so I wouldn’t know, but it could happen. Something I always find funny when playing Mother 3 is the thing that sometimes appear in battle text, saying stuff like “The Duster fell asleep”. 😉 Not to sound rude or anything, though! @Bliz: It is grammatically correct, but it doesn’t sound quite right. Now, if I can just get Norton Security Suite to recognise VBA-M as a trustworthy file, I’ll be cooking! #19 may have something to do with getting a Game Over and loading the previous save. These are all complete guesses. I’ve never been in the specific situations for 7, 11, and 12, and it’s been a long time since I’ve seen the game over screen, so take these with a grain of salt. They shouldn’t be hard to test, though. #3 is said by a man near the train station after getting off at Reindeer. #16 sounds familiar.. I think it was earlier on in the game. Maybe one of the citizens in Podunk? I believe #1 is said by a human in Canary village. I just had a thought. Will it be “Minny and Mimmy” or “Minnie and Mimmie” as the names of Ninten’s imouto-tachi (little sisters, for those who are less Japanese-savvy than even I)? I SWEAR I heard #16 somewhere around holloween/spookane one time, but haven’t been able to find it sense..
#2 is used when you try and sing onstage at the live house with less than 3 party members. #14 sounds like when you open an unopened present box and its empty. The problem is there are no empty presents in MOTHER1 (I think). #13 sounds like it went to Ellay. I think its when you talk to the cop who takes your equiped weapons. I could be wrong but I swear its in Ellay if not what the cop says. # 17 & 18 I think Pippy whats-her-name will say that when your inventory is to full to have her stuff given back to you. You have to talk to her again at her house for her to ask that. Its that or its the doctor you meet after Teddy gets hurt and then it gets returned. I hope my memory dident fail you. I did play MOTHER1 3 years ago though. I just checked the EB0 game over screen. Indeed, you will get #19 if you choose Rest rather than Continue. Somewhat relevant for discussion: what’s the trigger for Ninten’s mom changing the dialog she says when you ask to have your favorite food cooked? At first she remarks “My son can’t go on a journey when he’s so famished” and not too long afterwards she’ll say “Oh, you’re wounded. Have some food”. The Duster…sounds like The Flint. I’m still wondering if you’re going to change the level up screen, so that the “X went up by 1!” doesn’t only show up one by one, yet in Mother 1 you can see the past 3 “X went up by 1!”‘s. This always bugged me when I played Mother 1+2. #1: The young woman standing near the Podunk Dept. Store will say this if you have the Canary Chick with you and answer “no” to her question (“Did that Canary Chick come from Canary Village?”). #2: The first sentence is the first part of the text that is said when you try to sing in the Live House with only two people, but I have absolutely no idea what that second sentence is…I’m guessing if you try to sing with Ninten and/or Anna conscious only, but with the other two party members unconscious? #3: The man with the mustache right outside Reindeer station says this. #4: This is the last part of what the Twinkle Scientist says after purchasing the Real Rocket from him. #6: I’m going to take a guess and say that Pippi says this if you come back to get her Goods with Lloyd (and maybe Anna or Teddy) and Ninten is unconscious. #7: Possibly what MT0 said, but I’m not sure. That sounds like where it would be found though. #10: The woman who gives you the Ghost Key in Spookane (the mother of Buggerror/Ninten Rosemary) says this to you if you have received the key, but have not yet gotten the 4th melody yet. #11: The mayor says this if you talk to him after he tells you to rescue Pippi, but if you come back without her/before you rescue her. #12: The mayor says this if you come talk to him if Pippi is conscious and Ninten is not. #13: The waitress walking around (not the one behind the counter) in the Reindeer fast food restaurant says this. #14: This sounds like the message you get when you chack an empy present box (“It was empty”) but otherwise I don’t exactly know. #15: The janitor of Twinkle Elementary School says this to you from behind his door if you try to go in before you find the door to the roof locked. #16: The fat man in the room closest to the stairs in the Ellay hotel says this. #17 & #18: Pippi’s lines when you speak with her after she returns to her house and if she still has items. #19: Possibly a data corruption notice, or a failed save notice. #20: Sounds similar to the line the army man says if you don’t have enough money to pay him for the tank when he blocks the door into the Live House: “Not enough money. Boo, hoo, hoo. Ha, ha, ha…” But I really have no idea. The mayor’s secretary changes her line from “I ‘ll share the secret with you later” to “I ‘ve heard a rumor about a wonder girl. She will help you on your trip” after you save Pippi, but she never changes her line after that, even if you have Anna with you. Also, are you going to (or did you) fix the Fight/Quick Capsule bug that prevents Offense and Defense from rising properly during level-ups when you use them? Or is there no easy way to fix that? I hope all of this helps you Mato, even though I’m not 100% sure about everything – I went through as much of the game as I could. Sorry I can’t confirm what some of the lines are. Sorry about the double post, but I didn’t see MT0’s latest post about #19, which is correct. #16 is what every gamer needs to learn! Maybe you should change EARTH BOUND to MOTHER. Second half of #2 sounds like something that would be said if you got on stage while Ninten was “turned into a stone”. Just a guess though. I heard confirmation on Anime News Network’s “Anime/Manga/Game Industry Member Check In After Quake” forum that all people in Nintendo HQ are safe. (Including Miyamoto and ‘possibly’ Reggie [depending where he was during the incident]) I think all we can do is send our heart out to Japan in their most difficult time and hope for the best. Great work & Thank you, Mato! I can’t wait to play Mother with a decent translation. I’ll try to figure out some of those sayings if I have enough time. Just as a curiosity but, can you ‘copy and paste’ the ‘uncensored’ graphics from Mother (JP) to Mother 1+2? Mato has already posted up images showing that he can implement the uncensored graphics of, say, Smokey The Crow to replace the censored graphics. Okay. I was quite confused about that. Thanks. Amras: Right now I have it using “ie”, but it’s not the final draft. Is there a reason for one over the other? GreenTL: I personally kinda like it that way, I didn’t know it annoyed so many people though (well, I count only two so far anyway). Moonside: That’s basically exactly what I did, though I later found out that caused a few bugs I had to fix. You can see the gang member uncensored in one of the pics in this update, even. Anyway, like I mentioned, I want to include basic item/enemy/etc. translations for the M2 side too, so I’ve been dabbling in that today. I got the item names expanded to the max of 10 letters (I think some of the other patches had to work with a lot less), but the problem is how to compress the item names into ten letters. Here’s the quick list I made, anyone have suggestions for better names for these? I’ll post an enemy name list at some point too, not sure when. Its because the Luckywich can have six different effects. Does that capsule bug still happen in the M1+2 port? I could try to take a look at it, but it definitely sounds like it’d be something tougher to fix than the other stuff I’ve fixed. Yeah, it does. When loid got the Magic Candy, his offense was 5 points lower than his fight stat, even after a level up. Why don’t you rename the items to fit the limit. And i personally would like you to use Pencil Rocket instead of Bottle rocket. It might be easier to have the Fight Capsule and Magic Candy increase both Fight and Offense and the Speed capsule increase Speed and Defense. -“SLIME GEN” for the Slime Generator. -“P. ERASER” and “E. ERASER” for the Pencil and Eraser Erasers. -“BERRYTOFU” unless you want to stick with the Trout Yogurt. -“KINGSWORD,” KINGCLOAK,” KINGDIADM” and “KINGBRACE” for Poo’s equipment. -“MINORBAT” and “MAJORBAT.” “MLEAGUE” could be misunderstood to stand for “Major League.” I know the other one’s called the “Big League Bat” in EB, but, hey, clarity. May have more later. Keep being awesome. In the official MOTHER Encyclopedia (translated by our own Kenisu3000), the names of Ninten’s little sisters are spelled Minny and Mimmy. Official Anglicised spellings. I’d say it would make more sense to use the proper anglicized form of Minnie and use Mimmie for consistency’s sake (as opposed to something like Mimi), but then again I use the names Ana and Loid each time I play as opposed to Anna and Lloyd. Hey Mato, just coming out of the woodwork to thank you for everything you’ve been doing. First the Mother 3 translation, then Mother 1+2… wow. You’ve single-handedly kept a sustained interest in EB for a lot of people (me included!) for a long, long time. And BTW Mato, the RPGOne translation had expanded item names to 10 (and 9 for eqippable), just to let you know. I used several ideas from their translation in my list, so anyone who has played through M1+2 M2 side with the RPGOne (I, myself, being one of them) should recognize some of them. Thanks guys, I used a lot of your ideas! EDIT: For this basic menu translation stuff I’m just trying to stick somewhat close to the official EB names just so EB fans can get through the game easily – the names are already really weird as it is, so I don’t want to add even MORE confusion to it all. 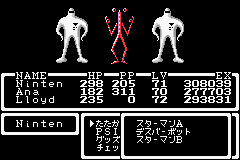 If I ever do a more thorough translation I’ll fix things up/change things to match Itoi’s intent, etc. Then shouldn’t they play the fully translated SNES version instead of the Menu Patch MOther 1+2? Why use Pokey instead of Porky? My comment to you on the enemies list: I find “MANFISHBRO” hilarious. -“DMND DOG” instead of “DIAM. DOG.” Or just truncate “diamond” the same way as you end up deciding to for equipment, whatever that may be. -“PSICHO” and “MAJPSICHO” for the Psychic Psycho and his Major counterpart? Not really a fan of these ones, but they occurred to me. -“GUARD DGGR” instead of “GRD.DIGGER.” The space is just to avoid a double D.
-“OLD MAN” instead of “PARTY MAN.” “Party man” sounds like he likes to party, rather than belonging to one. What am I gonna do? Portuguese names usually are way bigger than English! Oh, never mind. I was thinking about EB0. I’m especially glad that you were able to put a space between enemy names and the counter letters. Looks great! This may seem weird, but you could call the “Brain Food Lunch” something like “NOODLE LUN” (Noodle Lunch), if you get what I mean. Here are some other suggestions. Dang it Mato! I am still playing through EarthBound in cart form! I’m glad you finished this half, Mato! Do you think you can release an alpha patch with the finished MOTHER1 on it? Kay-O thanks. Ignore the above comment. I can wait. 7 is said by Loid’s dad. That’s all I know. Hey Mato, I have a question. Did you put Lloyd’s name as Lloyd or Loid? I’m fine with either way, but I’m just curious. I’m using Lloyd. 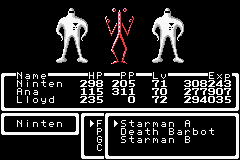 The spelling of “Loid” is due to me not being very good at Japanese and English names back when we first started earthbound.net/starmen.net. I understand. Any new updates on the simple translation of M2? Nothing much, mostly I just got a few more menus done. Well, ok. Also, are you going to translate the little boxes to the side of the characters when you name them? Do you understand these or do you need some pics? Hey Mato, what other projects do you think you’ll be working on after this? You’re my geek idol! Mrstaplez: well, first I really want to get my game merch site (see here) rolling again, I’ve been neglecting it horribly so it’s kinda floundering. I have a really neat idea for a game I want to do too, I think I’d like to work on that sometime soon too. It’s not EB-related, though it’ll have some EB-ish vibes to it. 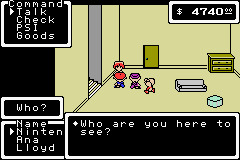 Just wondering, will Mother 2 of Mother 1+2 be translated? Honestly, I hope it is. so the remake hack is canned? @Lucastello How long have you been in that coma? Whoah, that’s the first time I’ve read about that idea. Very cool 🙂 I’ve never tried editing maps in EarthBound and I’m a little frightened to try if others report so much difficulty. MATO would you ever consider translating the fan game mother 4 in japanese if it ever came out? You rock Tomato!!! 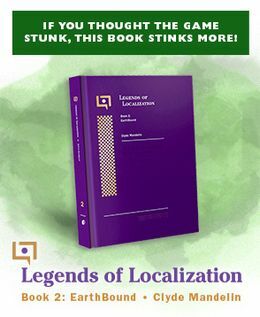 Thanks a million for working on this; I can’t wait to play the best in the series with a serious, excellent, Tomato-translation. Haven’t had much free time the past week, but I have gotten most of the menu patch stuff for M2 done. While working on it, I’ve come to realize that the programming done for this port is MUCH more evil than I had imagined, so it’d take just as much work (if not more) to fully translate/hack the M2 side of things as the Mother 3 project took. So unless I suddenly become a millionaire or something, I’m not gonna even attempt to fully translate the M2 stuff, the fact that the game has so many bugs, has inferior audio, etc. only strengthens that feeling. It’s a shame, being able to fully fan-translate all of the GBA games would’ve been neat. MATO by saying your not going to attempt to do it your saying your just going to release the translated M1 side or just use the EB text? I’m okay with that; the Mother 1 patch was really the only part I was looking forward to anyhow. 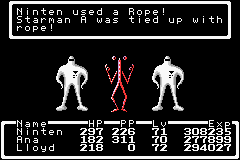 Earthbound is still a ton of fun to play on the SNES, despite the few oddities in the translation. Lets all buy lotto tickets for mato! btw, those updated sprites from the EB0 remake in the EB ROM, how hard would it be to replace the current Mother 1 sprites in the gba version with them? The gba probably supports them, as its essentially pretty much a portable SNES. Keeping it cannons cool, but in the end the main goal is fun right? ;D I think it’d be cool to go through mother with new enemy graphics! Some of the stuff in there would be impossible without rewriting the entire game, but it still looks neat. But I think if anyone were to put THAT much work into it, remaking the game entirely would be the better choice. What have you gotten so far, Mato? And what do you think of my suggestions? First of all, isn’t the legality of this questionable as it is. If you guys pay him to do it, then i’m pretty sure it would be flat out illegal. Second, i think the best idea would be what Schlupi said about six posts up: Gather together a team of people who have both the skill and the time to work on that project, and coupled with Mato’s translation, i think that’s really the best hope. Good point, Morgil. And I have a quick question Mato. Would converting the graphics be easy, but just time-consuming? Or hard and time-consuming? If it’s easy, then I could probably do it… if someone taught me how. Sometimes teaching is as time-consuming as doing it yourself, except alot of genuinely well meaning and good intentioned people give up halfway through when they see the work it is, become bored, or get busy. I’ve seen those kinds of things all the time in the homebrew community. Anyway, those who are really commited to helping talented ppl like Mato should start looking at tutorials and learning the basics and moving up from there. PK Hack might give some good training. If enough people gave as much of their time as Jeffman and Tomato have, maybe more cool stuff with these games will get done. Any resources you’d recommend for learning all the stuff you have Mato? @Mato Just wondering, which of the improvements shown would be impossible to implement without a complete rewriting? I think it’s about time we give Mato a break… He’s worked hard on the M1 side of this game, and that is more than appreciated, and it’s nearly complete. No, I think he should release M1 in any way before taking a long break. Can’t wait! Eric – you can’t apply the patch to an actual game cartridge. The reason it was suggested you buy the real MOTHER 3 when the M3 patch came out was to support Itoi and all the other people who worked on the game. You haven’t lived! Doink! I would try either Mother 3 or Earthbound before this one though. It’ll give you a better feel for the series I think. This one can get you caught up in graphics and the random encounters can be tedious (tho Mato’s easy patch will help with any grinding ;D). If you don’t want to download the ROM for earthbound, you can you play it over on consoleclassix.com for about 6 bucks a month rental. Its a legal service that stores the image in the RAM of your computer, as many as they own 😉 Thats how I’m playing through it (no cash for a cart =( ). For mother 3 you’d have to rip it like I mentioned above tho. I think it’s cuz Mother 1 can be frustratingly difficult at times. Though, hopefully, Mato’s Easy Ring will fix that. @Anonymous: I dunno. But hey, until Mato finishes his translation, I would recomend playing either Earthbound Zero, or using the RPGOne translation. And Mato, got any more stuff done? Oh cool! Then that means that I have 2 more games to play that are before that one! I know that Earthbound Zero is for the old Nintendo. But what is the last one? Plus as far as I’ve looked I can’t find any of them in English…other than Earthbound. Earthbound Zero was a prototype for the NES, if you look on sites like emuparadise its there. If you want to play it without piracy, you’ll have to wait until Tomato finishes this patch and buy the game + rip the ROM. If you want more info, go ahead and email me here: joshua_rex@rocketmail.com That way I don’t have to keep on reading this old topic. However, I WILL NOT link you the Rom. It goes against my ethics/morals/whatever you want to call it. If you want it that way, google’s you’re friend. @Mrstaplex: Thank you ^o^ earlier when I looked, I didn’t see your post…idk if my comp was being stupid or what. Jk, you’re perfectly welcome. Have fun! Dear Mato, the secretary in the Mayor’s office in Podunk changes what she says either after you get the first three melodies or after Lloyd joins your party. She says something along the lines of, In Snowman there is a girl who knows special powers. She may be able to help you on your quest, have you already met her? Ps. When this is all done do you think you could maybe create a patch that puts back in the original music please?